First a bit of background if you don't know what an auxlanger is: an auxlanger is a proponent and/or user of one or more international auxiliary languages, languages that have been constructed in order to be easy to learn and used by people of differing linguistic backgrounds as a common second language. Basically the role that English and a number of other languages hold at the moment (Indonesian, Bislama, Tok Pisin, Hebrew and many others serve this role as well) but much easier to learn. The most famous of these auxlangs is Esperanto, but there are many others such as Ido, Interlingua, Occidental, Lingua Franca Nova, Sambahsa, and others. Conlangs, on the other hand, are usually developed not specifically for practical usage but rather for fun, for fantasy worlds, for use among a select group, etc. Elvish is one example, Klingon is another. Since auxlangers are generally concerned with practical use there is usually not that much crossover between the two communities - auxlangers are generally more interested in using languages, conlangers with the languages themselves. But the newest conlang, Na'vi, is in an interesting and unique position that combines the two, and here's why. Reason #1: it's new, and will probably end up with a large user base. Na'vi is completely new, the creator of the language is alive, and given that James Cameron intends to create two sequels to the Avatar movie (which is close to $400 million at the box office so far with no end in sight) it is guaranteed to maintain a level of novelty and popularity for at least the next decade. Klingon is also quite popular but the last Star Trek movie had nothing to do with the Klingon language, and nobody knows whether the next one will either. Klingon is also identified with just one race of many in the Star Trek universe, one that appeals to some more than others. As for Elvish, J.R.R. Tolkien passed away more than three decades ago and it's always more difficult to maintain a language when the creator is no longer with us to answer questions. 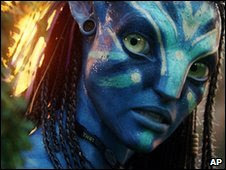 Less than a week after the release of the movie Avatar, the Na'vi language group on Facebook is rapidly approaching 500 members and a fairly busy forum for those learning the language has started. There is even a site where every existing bit of Na'vi dialogue has been uploaded (one example here). There is so much interest in the language, in fact, that one wonders if it won't be reverse engineered before its creator is able to publish a complete grammar on the language. At the moment the large group of people intending to learn the language is greedily gobbling up every piece of information they can find on it and are doing their best to learn it with the limited resources available. Okay, let's translate that into English. "Now it's around the time for snow to fall in your town (or in more natural English maybe something like "snow will probably be falling in your town soon"); the frustration of not being able to see (you) turns into anxiety." There it is, no need to change the word order whatsoever. This makes a translator's job many times easier. Since the word order is free, one could say Oel ngati kameie, Kameie ngati oel, Ngati oel kameie, or any other combination and the meaning wouldn't change. The -l after oe is the ergative case (i.e. it designates something that is going to perform a transitive verb on something else), and the -ti shows the accusative (the object that is having something done to it), so word order is irrelevant. Reason #3: Na'vi will positively influence other constructed languages. What better way to show that people from various linguistic backgrounds can communicate in a neutral second language than watching it happen with Na'vi? Watching dozens and dozens of people learn and use the language will provide a good current example of how this works. If someone criticizes the idea of an auxlang (Esperanto/Ido/etc.) a year or so from now, just show a video of a group of people speaking Na'vi, a language that wasn't even created to be an auxiliary language. And if it works for Na'vi then it certainly works for auxlangs. Reason #4: Na'vi seems reasonably easy to learn. Though conlangs aren't usually created with ease of learning in mind, it's actually pretty difficult to come up with a language as difficult as most natural languages are. Irregular plurals, weird verbs, messed up orthography, expressions that just don't sound right (you don't tell someone you like that "My desire to see you is very strong" even though it's grammatically correct), and everything else. From what we can tell so far, Na'vi seems to be quite a learnable language. Reason #5: Na'vi is based on a world orbiting a gas giant in a solar system near ours. Humanity is just on the verge of discovering other Earth-like planets, and Earth-like moons around gas giants in other solar systems will soon follow. Avatar is based on a very real possibility, that of humanity making its way to other parts of the universe and the choices people will make then, and whatever helps us to begin thinking about such issues as soon as possible can only be a good thing. Space exploration is about progress, and a common language for humanity is also about progress, so the two go hand in hand quite well. Whether the language ends up acquiring a few dozen users or a few thousand, each one of them will be using a language that is based on a story that could very easily become reality quite soon. And before "Avatar" and "Star Trek" there was Bill Shatner speaking Esperanto, in the horror film called "Incubus". Inspired by this, I looked at a guide of the language. It looks a bit complicated for me, though: singular, dual, trial, exclusive and inclusive pronouns, base eight number system (imagine having to translate lots of numbers), totally alien vocabulary (that makes sense but well it's hard to learn), that all doesn't look terribly easy. From what I've read it doesn't quite look to me like the creator meant for people to learn the language. I'd make a point about the pronunciation of Na'vi. The majority of the phonology seems simple enough, but by using a group of ejective consonants, while not entire unusual in world languages, Na'vi is made somewhat difficult for the rest of the world which doesn't use them. >From what I've read it doesn't quite look to me like the creator meant for people to learn the language. He did intend people (i.e. actors) to learn it, which is why it was only made to be exotic to a certain extent. It would have been possible to make it just a mass of clicks and other sounds if one really wanted an alien-sounding language. Though Na'vi doesn't resemble any other language, it also doesn't have any elements that aren't present in some languages on Earth. To me it feels a bit like Turkish and Japanese plus ejective consonants and an ergative case. If having a free word order is the only positive thing about it then I doubt it can be successfully used as an auxiliary language. Free word order implies that it has some complicated system of grammatical cases. Like Latin. I don't know Na'vi but from this post I conclude that it's probably bad idea. Also after seeing an example I though that it's an erg-abs language (this is already hard to get for users of nom-acc languages) but you have marked "you" as an accusative instead of absolutive so it's something even more strange. Free word order isn't "the only positive thing about it", it's something that hasn't been tested in other auxlangs before so Na'vi will provide an example of this. Except that a very free word order is in fact implemented in Esperanto, and presumably in other auxlangs as well. Infixes on the other hand, are perhaps likely to make a language significantly more difficult, without any clear benefit. The same applies to Klingon. Some of the reasons for the imminent popularity of Na'vi are quite convincing. Differences in word order might be under estimated by most people who don't translate between languages with different word orders. And this is a good point which works in the favour of Na'vi. Standard Arabic too is free of word order, especially if read with the diacritical points for the short vowels. The same applies to a few other Semitic languages as well. But then Arabic grammar (and script) can get a little tough for some people, whereas it seems Na'vi grammar is not all that challenging. This has got me interested in auxlangs and I should learn one in the near future. We also need a future international language. One which is easy to learn, as well ! At least Bill Shatner speaks Esperanto. Shatner doesn't speak Esperanto. He just signed up to do a movie in it. Also, his pronunciation is horrendous.